I’m so very happy and proud to announce that I’ve signed a contract with Deeds Publishing of Athens, Georgia, to publish my novel, Black Iron Mercy. Final edits have been applied to the manuscript and it’s on its way to the creative director for the layout process. Whew! It’s been four and a half years since I started the research for this project. Nine months of research, two years of writing, a lifetime of editing, and five long months of querying and rejection have culminated in success. It’s been a long road, but could have been so much longer if not for the help and support of my family and friends. Thank you to all of YOU, my friends and followers, for your continued support through your words of kindness and encouragement, assessment and criticism. So many of you have said the right words at just the right moment, providing motivation and inspiration to continue this voyage. I’m grateful! The song has long been a favorite of bluegrass fans and civil war enthusiasts alike, but is there any truth behind the lyrics? Death took no sides when it came that day. They placed no stones at their head or feet. Dry Run Creek runs through the Ozark Mountains, spurring from the gorgeous Norfolk Lake, which is constantly drawing tourists and fishermen to the town of Mountain Home, Arkansas. 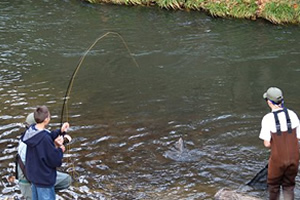 The creek boasts beauty, clarity, and, if you’re mobility impaired or under the age of 16, an amazing trout fishing experience. What it does not boast is a civil war cemetery with 1300 unmarked graves. There is also a Dry Run Creek in Iowa and a “Dry Run Creek Cemetery” in Boise, Idaho. Need we even discuss these? But the McPeak boys were Virginians, not Arkansans… so any motivation for local legend can be ruled out. Some believe the song’s title is from a combination of the Battles of Bull Run and Wilson’s Creek. But word hadn’t gotten to Dry Run Creek. Wherever you might believe the origins of the song came from, the number “1300” should give a clue as to the validity of the story. Although 1300 is not a high casualty amount for a civil war battle, it would be an extremely high number of killed for a battle fought after the surrender at Appomattox. By comparison, the battle fought at Palmito Ranch, considered to be the last major engagement of our civil war, is well documented and known by anyone who claims to be a true civil war buff. It was fought in Cameron County, Texas on May 12th and 13th, 1865, more than a full month after Lee surrendered to Grant in Virginia. The casualty count at Palmito Ranch? Four killed, 18 wounded, 104 captured. Likewise, the Battle of New Orleans is submerged in legend and folklore for being fought more than two weeks after the War of 1812 had ended with the signing of the Treaty of Ghent. How many died during the Battle of New Orleans? 440 or so, depending on your source. A battle that saw 1300 die would see at least twice that many wounded, another gross or two captured, and if it had been fought after the end of a war it would be forever seared into the minds of generations to come. Still, it’s a darn good song. According to “Wisconsin losses in the Civil War” compiled by Charles Edward Estabrook, 1915, 275 of the 1203 soldiers of the 2nd Wisconsin Regiment died while serving. 105 were killed in action; 62 died of wounds; 62 died from disease. One died in a fall less than a month before Gettysburg. Other sources differ slightly, but most are comparable. Wikipedia says the regiment saw 315 total deaths. These numbers do not include those who were wounded and survived. They also don’t show those that were wounded multiple times, perhaps as many as three or four, before finally succumbing or being no longer fit for duty and sent home. 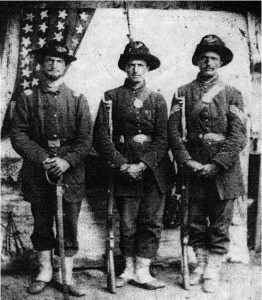 In a war that saw one soldier in ten killed in action and one soldier in three die of disease, the 2nd Wisconsin Regiment suffered 3.4 soldiers killed for every one that died of disease. It was through their blood that they forged their iron. Included among the deaths from disease is John A Thompson, who is listed in the roster as being simply from “Wisconsin.” Thompson was murdered sometime in March of 1864. If anyone has more information on that story, please share! Mr. Dawes is quite a remarkable man. Forever cemented in the histories of the Iron Brigade, the affections of Mauston, WI natives, the leadership of the 6th Wisconsin, and the spirit of the “Lemonweir Minutemen,” Dawes wasn’t even a Badger by birth. Like everyone else in early 1861, Dawes got swept up in the excitement of Lincoln’s call for Volunteers. Dawes, who happened to be in Mauston, Wisconsin with his father on extended business at the time of the firing on Fort Sumter, chose to raise a company of volunteers right there, rather than return to his home town of Marietta, Ohio to do so. He’d get to lead them under that banner, too. At 2nd Bull Run, South Mountain, Antietam, and while covering the retreat of the Army after Chancellorsville. All the while, he lead from the front while enjoying an uncanny ability to come through battles unscathed, bringing to mind suggestions of the fortunes of Wyatt Earp and Captain Richard Winters, who had both had plenty of opportunities to die in fire fights but had escaped all of them unharmed. By Gettysburg, Dawes was a Lt. Colonel, leading the 6th Wisconsin in the absence of Colonel Edward Bragg, who was convalescing in Washington after being kicked in the foot by a horse. Here, he’d lead the regiment in the famed railroad cut charge, escaping unharmed while leading the 6th in capturing the entire 2nd Mississippi Regiment. Examining this last statement, there are typically three officers per company: a Captain, a 1st Lt, and a 2nd Lt. There are ten companies. 30 officers, ranked Captain or lower, plus the Colonel, Lt. Colonel, Major, and the Adjutant of each regiment. Since there were four regiments in the brigade, we’ll multiply the numbers by four and come up with 136. Out of 136 field officers, the Iron Brigade had only four that were fit for duty on July 4, 1863. It would be most interesting to see what was going on in Lt. Colonel Dawes mind while he was drinking his coffee and writing his report in the rain on that day… which happened to be his 25th birthday, by the way. Whether or not Dawes believed that he was being spared for higher purpose or not is not chronicled, but he certainly gave Providence credit for his survival. He’d lead the regiment again and again and again, at The Wilderness, Spotsylvania, and Cold Harbor. Dawes’ three year enlistment came up soon after. He would indeed go on to big things… including a stint in congress representing the 15th Ohio District. Lt. Julius Waldschmidt, CO G, 19th Indiana Infantry Regiment. Born in Wetzlar, Germany on February 20, 1836, Waldschmidt immigrated to America in the 1850s, settling in Elkhart, Indiana. Mustering in as a sergeant on July 29, 1861, he would be one of the many who made the leap from enlisted man to officer during the war. At his post throughout the campaigns of 1862 and 1863, Waldschmidt would be among the few who remained unharmed after the battle of Gettysburg… a battle that saw the 19th Indiana take 73% casualties. Wounded at the battle of Wilderness in May of 1864, Lt. Waldschmidt would muster out of the 19th Indiana that fall, accepting a Captain’s commission in the 152nd Indiana Regiment in March of 1865. He’d serve out the war in this capacity, mustering out as a Major on August 30, 1865 in Clarksburg, West Virginia. After the war, he’d spend many years in Goshen, Indiana, where he served as a deputy United States Marshall. He died on January 31, 1918 in South Bend, Indiana. 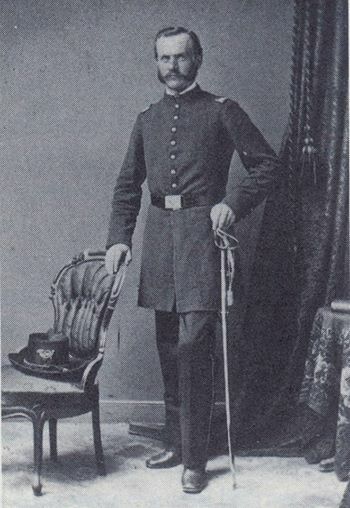 Lt. Frank A Haskell (1828-1864), Adjutant, 6th Wisconsin Infantry. Haskell, a Vermonter by birth, was a Dartmouth graduate who was practicing law and drilling a militia unit in Madison, Wisconsin when the Civil War began. Quick to offer his services to his country, Haskell was commissioned as 1st Lt and served as the 6th Wisconsin’s Adjutant for nearly a year. Known for his attention to detail and commitment to excellence, the 6th owed much of its discipline to the efforts of Haskell. In April of 1862, Haskell’s experience and professional bearing caught the attention of the Brigade’s new commander, General John Gibbon, who made Haskell his new aide-de-camp. Haskell would apply his trade in fine fashion, serving at the General’s side through the Northern Virginia Campaign and the Maryland Campaign, when the Iron Brigade would earn its metallic nickname. 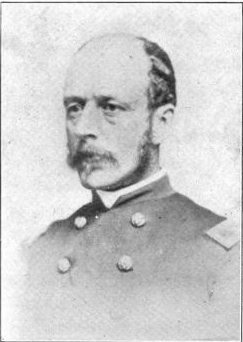 Having followed Gibbon when the General was promoted to command of the 2nd Division of I Corp, Haskell served in that capacity until Gibbon received a wound in the Fredericksburg Campaign, after which Gibbon was replaced. Gibbon would recover. This time, Haskell followed Gibbon when he was named commander of the 2nd Division, II Corp.
Gibbon’s division would see action at Chancellorsville, and then again at Gettysburg, where they would bear the brunt of the attack that would become known as “Pickett’s Charge.” Haskell, after Gibbon went down with another wound, admirably led the men of the division against the assault. In November of 1863, Haskell would accompany Gibbon back to the Gettysburg Battlefield for the dedication of the National Cemetery. Both men would bear witness to Abraham Lincoln’s Gettysburg Address. 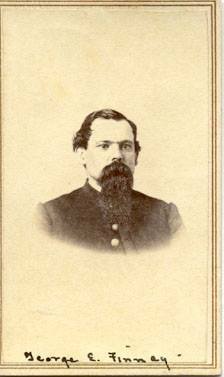 On February 9th, 1864, Frank Haskell was appointed Colonel of the 36th Wisconsin Infantry. On June 3rd, after the commander of the 1st Brigade, 2nd Division, II Corps, Colonel Henry Boyd McKeen was killed, Haskell took command of the brigade. A few minutes later, he would be killed by a bullet through the temple as he led the brigade in the final assault at Cold Harbor, Virginia. He was 35 years old. Upon receiving news of Haskell’s death, General Gibbon lamented, “My God! I have lost my best friend, and one of the best soldiers in the Army of the Potomac has fallen!” Gibbon wrote to his wife that he had planned on promoting Haskell to a field command after the battle. Frank Haskell is buried in Silver Lake Cemetery in Portage, Wisconsin. George E Finney, Sergeant, CO H, 19th Indiana Infantry Regiment. Finney, a resident of Elizabethtown, Indiana, would later serve as a Lieutenant and then Adjutant of the 20th Indiana Regiment. Finney would respond to a request from David Stephenson, who had announced to the citizens of Indiana that he was looking for “A complete list of our brave soldiers who have died from sickness or fallen on the battlefield. It is my aim to do justice to the living, and to embalm in the hearts of Indiana’s sons the memory of the patriotic dead who have fallen in defense of our national government.” Finney’s account of the 19th Indiana’s role in the war from its inception until August 1st, 1863 would appear in Stephenson’s “Indiana’s Roll of Honor,” published in 1864. Many minor errors and omissions in the text, however, indicate that someone not familiar with the regiment may have had a hand in editing Finney’s document. The Iron Brigade is widely renowned for its discipline, performance, valor, and for having suffered the highest percentage of casualties of any brigade in the Army of the Potomac during the Civil War. Few major battles in the eastern theater of the war can be mentioned without the inclusion of the brigade, which was initially composed of the 2nd, 6th, and 7th Wisconsin regiments and the 19th Indiana Regiment. The 24th Michigan Regiment was added in December of 1862, after the brigade had suffered heavy losses in the campaigns of that season. But fame, glory, and even the occurrence of battle were a long time coming for the brigade, as one competent officer can surely attest. Rufus Dawes was a 22-year-old graduate of Marietta College when Fort Sumter was fired upon. A native of Marietta, Ohio, Dawes found himself in Juneau County, Wisconsin at the time of Lincoln’s call for 75,000 volunteers. Dawes went about the business of forming a company in Mauston, Wisconsin, drawing up a pledge and gathering volunteers on the 25th of April, 1861. On April 30th, one hundred men met in Mauston’s Langworthy’s Hall to organize the company. Dawes was elected “Captain,” which was no surprise, and the company adopted the name “The Lemonweir Minute men,” after a local sleepy river, and spirits were high and the excitement level through the roof. The question of being mustered into the active service now filled the minds of all, and by the second week of May, having received no word from the government as to such, Dawes sent an influential friend to Madison to advocate on behalf of the company. Shortly, word came that the company was to be mustered into the seventh regiment, but no solid date for such an event to occur was given. Dawes waited patiently, yet anxiously. In the meantime, his recruits went about their daily lives, scattered throughout the whole of Juneau County, causing concern in the captain. To ensure he’d have the eighty-three men required to report, Dawes initiated another recruitment drive. ENLISTMENTS WANTED FOR THE LEMONWEIR MINUTE MEN! More than two months after organizing at Langworthy’s Hall, the company, in compliance with orders, took the cars for Madison and joined the Sixth Wisconsin Volunteer Infantry Regiment. They were able to do so because several companies that had registered higher on the list had failed to report. The Lemonweir Minute Men were mustered in as Company K of the Sixth Wisconsin, to serve for three years or the duration of the war, should it end sooner. Even now, as the green troops of McDowell’s army moved south to confront the green troops of Beauregard’s, near a creek known as “Bull Run,” the Wisconsin boys were more than a year away from seeing their first real battlefield. Instead, they settled into camp at Washington City, where they’d be placed under General Irvin McDowell, who had just recently been trounced at Bull Run. There, they’d be charged with protecting the capital and spend their time becoming soldiers of a real sort, drilling, drilling, drilling. The men were becoming restless and agitated. Some feared they’d never see combat. When McClellan led the Army of the Potomac out of Washington in the spring of 1862, in what would become known as the “Peninsular Campaign,” the Wisconsin boys were left behind, protecting Washington. The army had been reorganized, and the Sixth Wisconsin had been reassigned to a brigade with the Second Wisconsin, who had been at Bull Run, as well as the Seventh Wisconsin and 19th Indiana, both of which had yet to see combat. This grouping would remain for the duration of the war. While McClellan and his army floundered to the south, the brigade, under General John Gibbon, marched, drilled, trained, and molded themselves into one of the finest brigades in all of the world. On the parade ground, others took notice. McClellan’s campaign would prove to be a disaster, ending with the Army of the Potomac scampering back toward Washington and the General himself being replaced by General John Pope. Now, Gibbon’s brigade got their chance. At Brawner’s Farm, in the 2nd Bull Run Campaign, the brigade would stand toe to toe with the Stonewall Brigade, slugging it out with the veterans for more than an hour. At the 2nd Battle of Bull Run, they’d hold their ground as the rest of the army collapsed around them. The brigade would help cover the retreat of Pope’s battered army. They’d see action at Antietam, Fredericksburg, Chancellorsville, Gettysburg, Spotsylvania Court House, Cold Harbor, Petersburg, Weldon Railroad, and Five Forks. Dawes finest moment would come on the first day of the Battle of Gettysburg, where his Sixth Regiment would charge alone and unsupported on a Rebel line that was hidden in an unfinished railroad cut. He and his men would capture nearly the entire 2nd Mississippi Regiment, including its officers and colors. The victory came at a very high price, however. In every engagement, the Iron Brigade would hold their own, proving that their nickname was more than a label. They earned their name through the expenditure of flesh and blood, and in giving the enemy worse than they received. Outnumbered in nearly every engagement, the brigade seldom, if ever, turned their backs to the enemy. Dawes, having turned down a promotion to Colonel in late July of 1864, mustered out of the service on August 10 of that year. He would settle into civilian life with his wife, Mary, in Marietta, Ohio, operating a lumber business. 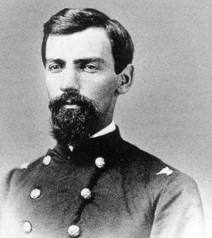 Dawes would be promoted to a rank of Brevet Brigadier General of Volunteers to rank from March 13, 1865 by President Johnson. The Senate would confirm the promotion on April 10, 1866. In August of that year Mary would give birth to a son, Charles, who would later serve as Vice-President of the United States under Calvin Coolidge. Together, Rufus and Mary would raise six children. Dawes would serve on the Board of Trustees for his alma mater, Marietta College, from 1871 until his death. He also served for a time as a trustee for the Ohio Institute for the Deaf and Dumb. He spent one term in congress, elected as a Republican in 1881. He lost his bid for reelection due to his resistance to the Chinese Exclusion Act of 1882. Rufus R. Dawes died at his home in Marietta, Ohio on August 1, 1899. He was 61. He is buried at Oak Grove Cemetery in Marietta. Photo courtesy of Wikipedia. It is public domain. What makes a man who has lost several toes and half a foot in combat re-enlist? The price of thread, for one thing. Mickey would lose much of the foot, being mustered out and sent home to Mauston, Wisconsin. He couldn’t sit still for long. Boredom… boredom…. By the end of February, Mickey was back with Company K at Belle Plain, Virginia, having re-enlisted and traveled by railroad and boat to rejoin the company. This was the 2nd of three times he’d sign up with the 6th. After being shot in the shoulder in the charge on the railroad cut at Gettysburg, Mickey would convalesce long enough to meet his future wife, fall in love, and then sign up again. He’d return to Wisconsin after mustering out in 1865 with his new wife, Angeline, and an infant son.